I love Christmas traditions. Trimming the tree, listening to Christmas music, baking treats and watching ABC Family's 25 Days of Christmas to name a few. This year I'm so excited for a brand new (to us) Christmas tradition - The Elf on the Shelf . The fun part comes as a special holiday game. After the Christmas decorations go up, this magical little elf will appear somewhere that your child will notice within the house. What is he doing?? He's keeping an eye on your for Santa, of course! Each day leading up to Christmas the elf (with a little help from mom and dad) will magically appear at a new location in the house. The kids will love finding him, and will do their best to be good little boys and girls during the holiday season. The one major rule is this: you can't touch the elf, or his magic will disappear! If he doesn't have any magic left, he won't have a way to get back to Santa at the North Pole! I've wanted The Elf on the Shelf since our daughter was born. This Thursday, she will be two years old, and our elf (whom we have yet to name!) is on the way to our house as we speak! BUY IT! 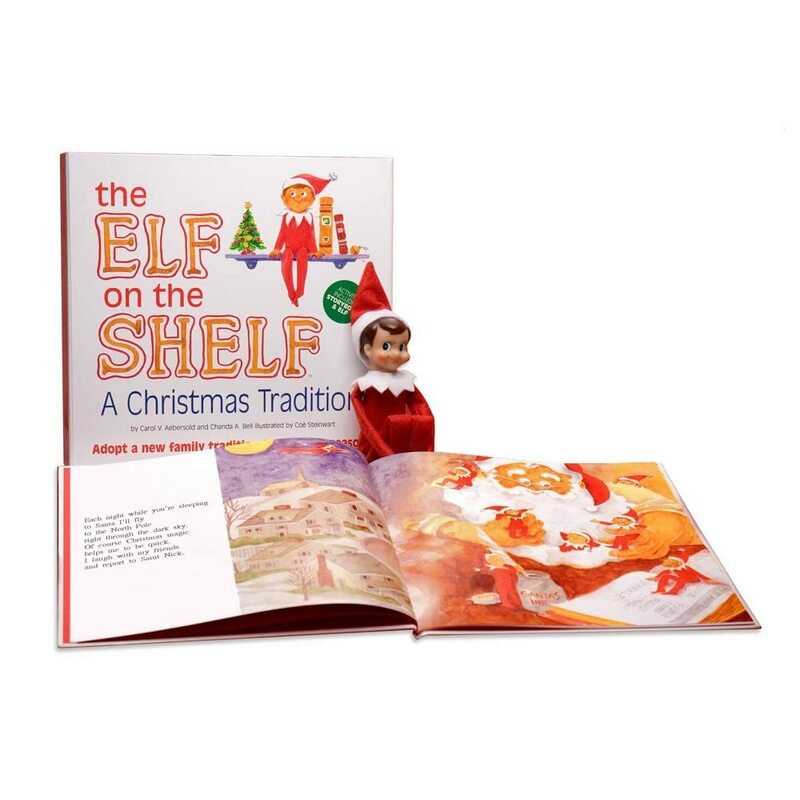 The Elf on the Shelf is sold for $29.95 and can be found on Amazon.com. WIN IT! Holly at Nap Time is giving one lucky winner their very own Elf on the Shelf this holiday season. Open to US residents ONLY - please do PO boxes. Winner will have the choice between light-skinned blue-eyed elf and dark-skinned brown-eyed elf. Winner will be contacted by email and will have 48 hours to respond before a new winner is chosen. I would love to win this because (as you know) I could use a little elf to watch over all these children that I care for. Plus all the grandchildren would be so excited. I love how we always exchange gag gifts with my Mom's extended family rather than real gifts. It gives lots of laughter, is inexpensive but oh so fun and makes for some great memories! I NEED to win this for one of the two four year olds that I take care of. I think having an Elf watching would make the month of December go oh so smooth! I would like this for my 3 and 6 yr olds. They are the perfect ages for it. My favorite christmas tradition is playing dirty santa with the family! I would love to win this for my nephew, his girlfriend and their 1 year old so they can start some of their own family traditions! I would love to win this to use with/against (LOL) my son next Christmas! I'd love to win this for my girls. They are really into Christmas. My fave christmas tradition is setting out cookies & milk for Santa! Would love to win it for my kids! I would LOVE to win this for my sisters!!! I'd love to win this for my sister! My favorite tradition is every Christmas Eve before bed we read A Night Before Christmas. I would Love to win this for my two boys. I think it would be tons of fun! Our favorite Christmas tradition is when we get together as a family for our annual party. So fun! I would love to win this for my 4 yr old son. I would love the elf for my two kids!! I'd like to win for my daughter who is three to start a family tradition, I'd been wanting to get an elf for a while! I would love to get it for my two young children. Thanks! Would love it for my little one! Our favorite holiday tradition is opening a game we can play on Christmas Eve. I have two boys, and one girl~they all would love this! I would love to win the elf for my son. We have Advent Calendars, that my Grandmother made. They have pockets to leave little treats for the kids, as they count down the days to Christmas.They have so much fun with this! I love seeing their faces, as they find the daily surprise!! Christmas morning we have a long drive to see family and it's just hectic in general so wedo our own litle thing on Christmas Eve. We put our son to bed early in our bed. After he is sleeping we go in his room set up a Christmas tree and lights just for him and put all of his gifts under his tree. We wake him up and make some excuse like we thought we heard something. He thinks for a second then makes a mad dash to his room and I just love seeing his eyes light up. I don't know how long we can keep it up or how old we'll be when it won't work but for now I enjoy it. Love to get this one! I'd never heard of this until this year! A family I babysit here in Chicago has one and the kids are OBSESSED. Such a cute idea! I would give this to my son this christmas!! I would love to win this for one of my granddaughters. i'm the oldest sibling and one year my mother called me and two other siblings together and told us that there would be no presents that year, except for our little sister who still believed in Santa. We told her we understood and tried hard not to think about it. Christmas morning there were two small presents for each of us. Granted, it was something she made for us, but it is still the best Christmas I ever remember. Want to win for my son & daughter! I would love to win this for my father who has always decorated the house with elves for Christmas. I would love to win this for my Grandbabies! What a great holiday tradition. I'd love to win it for my beautiful Grandson. :) Thanks for the opportunity. GFC name is Lucky47. My favorite Christmas tradition is every year we all gather for mass on Christmas Eve and then on Christmas Day we sit down to a huge family dinner while Christmas songs play. I want to win this elf for my 3-year-old daughter. She would love it! I would love to win this for my nephew! He would just love it! My favorite Christmas tradition is our big Christmas Eve party. And the food! Gotta love the food! I have wanted "Elf on a Shelf" for my son since I saw it! He is now almost two years old and this would be a perfect tradition to start with him! My favorite Christmas tradition is baking Christmas cookies with my sons and letting them decorate! I wanted "Elf on a Shelf" for my niece. She'd love it! My favorite Christmas tradition is feeding the reindeer on Christmas Eve with glitter and oats. The kids love it! New follower here from I Am A Reader, Not A Writer and All-Consuming Books blog hop. If you get a chance come stop by my blog for a visit! I'd love to have you! I would love to win Elf of Shelf for my 3 kiddos to start a new family tradition. It would also help keep them busy while their dad is away. He has been living and working 1231 miles away since August. My favorite family tradition is that we get all the kids in their pjs, drive around looking at holiday lights and then get dairy queen blizzards. I have been wanting one of these for our kids for years. No time like the "present" to get one for our home. I love the story and creating a new tradition. Thanks for this GREAT Giveaway!! Our favorite Christmas tradition is wrapping gifts and shopping for groceries for a family in need. We all pick out a extra something that is just from each of us. We try to stress the giving is the best part of Christmas and that's why Jesus was born as God's Gift to the world. I would love to win this for my boys-we've been thinking this year we would start this wonderful tradition! My favorite Christmas tradition is finding(some years we do a real tree) and decorating the Christmas tree. Hot cocoa,Christmas music,family and *hopefully* falling snow make the day memorable. My favorite Christmas Tradition is baking Christmas sugar cookies then decorating them with the kids. i would love to win this for my sister's 3 kids!!! I want this for my son!! I've been wanting to start this tradition with him and now that he's 4 it seems like the perfect year! My favorite tradition was started by my parents. Every Christmas eve we're allowed to open one present... it's always Christmas pajamas. I've always loved it and have started it with my kids. I'd love to win this for my little niece! My favorite Christmas tradition is going to midnight Mass with my family! This would be for my girls. This would be good for my classroom. I just found out last night from a friend that there is a family that needs help for Christmas. They are kind people, always do fundraisers and help others and now they have lost their jobs and their house may be foreclosed on and have no money for Christmas. They have 2 small children and I would love to win this for them for Christmas. Thank you for the giveaway. I'd love to have this for my 5 kiddos, what a fun tradition it would be!!! I want to win this for my 3 little boys, I've been eyeing it up for a while! Would love this for my son!! i would wrap it and put it under the christmas tree for my letti! I would love to win this for my 2 kids!!! (Quanda) I'd like to win this for my granddaughter.